Imitations of Sassanian coins and Chinese cash coins as well as "hybrids" of both. Sogdia (/ˈsɒɡdiə/) or Sogdiana was an ancient Iranian civilization that at different times included territory located in present-day Kazakhstan, Tajikistan, and Uzbekistan such as: Samarkand, Bukhara, Khujand, Panjikent, and Shahrisabz. Sogdiana was also a province of the Achaemenid Empire, eighteenth in the list on the Behistun Inscription of Darius the Great (i. 16). In the Avesta, Sogdiana is listed as the second best land that the supreme deity Ahura Mazda had created. It comes second, after Airyanem Vaejah, "homeland of the Aryans", in the Zoroastrian book of Vendidad, indicating the importance of this region from ancient times. Sogdiana was first conquered by Cyrus the Great, the founder of the Achaemenid Empire. The region would then be annexed by the Macedonian ruler Alexander the Great in 328 BC. The region would continue to change hands under the Seleucid Empire, Greco-Bactrian Kingdom, Kushan Empire, Hephthalite Empire, and Sasanian Empire. The Sogdian states, although never politically united, were centred on the main city of Samarkand. Sogdiana lay north of Bactria, east of Khwarezm, and southeast of Kangju between the Oxus (Amu Darya) and the Jaxartes (Syr Darya), embracing the fertile valley of the Zeravshan (ancient Polytimetus). Sogdian territory corresponds to the modern provinces of Samarkand and Bokhara in modern Uzbekistan as well as the Sughd province of modern Tajikistan. During the High Middle Ages, Sogdian cities included sites stretching towards Issyk Kul such as that at the archeological site of Suyab. Sogdian, an Eastern Iranian language, is no longer a spoken language, but its direct descendant, Yaghnobi, is still spoken by the Yaghnobis of Tajikistan. It was widely spoken in Central Asia as a lingua franca and even served as one of the Turkic Khaganate's court languages for writing documents. Sogdians also lived in Imperial China and rose to special prominence in the military and government of the Chinese Tang dynasty (618–907 AD). Sogdian merchants and diplomats traveled as far west as the Byzantine Empire. They played an important part as middlemen in the trade route of the Silk Road. While originally following the faiths of Zoroastrianism, Manichaeism, Buddhism, and to a lesser extent, Nestorian Christianity from West Asia, the gradual conversion to Islam among the Sogdians and their descendants began with the Muslim conquest of Transoxiana in the 8th century. The Sogdian conversion to Islam was virtually complete by the end of the Samanid Empire in 999, coinciding with the decline of the Sogdian language, as it was largely supplanted by Persian. Oswald Szemerényi devotes a thorough discussion to the etymologies of ancient ethnic words for the Scythians in his work Four Old Iranian Ethnic Names: Scythian – Skudra – Sogdian – Saka. In it, the names provided by the Greek historian Herodotus and the names of his title, except Saka, as well as many other words for "Scythian," such as Assyrian Aškuz and Greek Skuthēs, descend from *skeud-, an ancient Indo-European root meaning "propel, shoot" (cf. English shoot). *skud- is the zero-grade; that is, a variant in which the -e- is not present. The restored Scythian name is *Skuda (archer), which among the Pontic or Royal Scythians became *Skula, in which the d has been regularly replaced by an l. According to Szemerényi, Sogdiana (Old Persian: Suguda-; Uzbek: Sug'd, Sug'diyona; Persian: سغد‎ Soġd; Tajik: Суғд, سغد Suġd; Chinese: 粟特 Mandarin sùtè; Ancient Greek: Σογδιανή) was named from the Skuda form. Starting from the names of the province given in Old Persian inscriptions, Sugda and Suguda, and the knowledge derived from Middle Sogdian that Old Persian -gd- applied to Sogdian was pronounced as voiced fricatives, -γδ-, Szemerényi arrives at *Suγδa as an Old Sogdian endonym. Applying sound changes apparent in other Sogdian words and inherent in Indo-European he traces the development of *Suγδa from Skuda, "archer," as follows: Skuda > *Sukuda by anaptyxis > *Sukuδa > *Sukδa (syncope) > *Suγδa (assimilation). Right image: a barbaric copy of a coin of Euthydemus I, from the region of Sogdiana; the legend on the reverse is in Aramaic script. Most merchants did not travel the entire Silk Road but would trade goods through middlemen based in oasis towns such as Khotan or Dunhuang. The Sogdians, however, established a trading network across the 1500 miles from Sogdiana to China. In fact, the Sogdians turned their energies to trade so thoroughly that the Saka of the Kingdom of Khotan called all merchants suli, "Sogdian", whatever their culture or ethnicity. Unlike the empires of antiquity, the Sogdian region was not a territory confined within fixed borders, but rather a network of city-states, from one oasis to another, linking Sogdiana to Byzantium, India, Indochina and China. Sogdian contacts with China were initiated by the embassy of the Chinese explorer Zhang Qian during the reign of Emperor Wu (r. 141–87 BC) of the former Han dynasty. Zhang wrote a report of his visit to the Western Regions in Central Asia and named the area of Sogdiana as "Kangju". Suyab and Talas in modern-day Kyrgyzstan were the main Sogdian centers in the north that dominated the caravan routes of the 6th to 8th centuries. Their commercial interests were protected by the resurgent military power of the Göktürks, whose empire was built on the political power of the Ashina clan and economic clout of the Sogdians. Sogdian trade, with some interruptions, continued into the 9th century. For instance, camels, women, girls, silver, and gold were seized from Sogdia during a raid by Qapaghan Qaghan (692–716), ruler of the Second Turkic Khaganate. In the 10th century Sogdiana was incorporated into the Uighur Empire, which until 840 encompassed northern Central Asia. This khaganate obtained enormous deliveries of silk from Tang China in exchange for horses, in turn relying on the Sogdians to sell much of this silk further west. Peter B. Golden writes that the Uyghurs not only adopted the writing system and religious faiths of the Sogdians, such as Manichaeism, Buddhism, and Christianity, but also looked to the Sogdians as "mentors" while gradually replacing them in their roles as Silk Road traders and purveyors of culture. Muslim geographers of the 10th century drew upon Sogdian records dating to 750–840. After the end of the Uyghur Empire, Sogdian trade underwent a crisis. Following the Muslim conquest of Transoxiana in the 8th century, the Samanids resumed trade on the northwestern road leading to the Khazars and the Urals and the northeastern one toward the nearby Turkic tribes. Historical knowledge about Sogdia is somewhat hazy during the period of the Parthian Empire (247 BC – 224 AD) in Persia. The subsequent Sasanian Empire of Persia conquered and incorporated Sogdia as a satrapy in 260, an inscription dating to the reign of Shapur I noting that its limits formed the northeastern Sasanian borderlands with the Kushan Empire. However, by the 5th century the region was captured by the rival Hephthalite Empire. It appears, however, that direct trade with the Sogdians remained limited in light of the small amount of Roman and Byzantine coins found in Central Asian and Chinese archaeological sites belonging to this era. 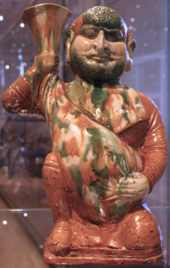 Although Roman embassies apparently reached Han China from 166 AD onwards, and the ancient Romans imported Han Chinese silk while the Han-dynasty Chinese imported Roman glasswares as discovered in their tombs, Valerie Hansen (2012) wrote that no Roman coins from the Roman Republic (507–27 BC) or the Principate (27 BC – 330 AD) era of the Roman Empire have been found in China. However, Warwick Ball (2016) upends this notion by pointing to a hoard of sixteen Roman coins found at Xi'an, China (formerly Chang'an), dated to the reigns of various emperors from Tiberius (14–37 AD) to Aurelian (270–275 AD). The earliest gold solidus coins from the Eastern Roman Empire found in China date to the reign of Byzantine emperor Theodosius II (r. 408–450) and altogether only forty-eight of them have been found (compared to thirteen-hundred silver coins) in Xinjiang and the rest of China. The use of silver coins in Turfan persisted long after the Tang campaign against Karakhoja and Chinese conquest of 640, with a gradual adoption of Chinese bronze coinage over the course of the 7th century. The fact that these Eastern Roman coins were almost always found with Sasanian Persian silver coins and Eastern Roman gold coins were used more as ceremonial objects like talismans confirms the pre-eminent importance of Greater Iran in Chinese Silk Road commerce of Central Asia compared to Eastern Rome. Aside from the Sogdians of Central Asia who acted as middlemen in the Silk Road trade, other Sogdians settled down in China for generations. Although many Sogdians had fled Luoyang following the collapse of the Jin Dynasty's control over northern China in 311 AD, some Sogdians continued living in Gansu. Sogdian families living in Gansu created funerary epitaphs explaining the history of their illustrious houses. For instance, a sabao (薩保, from Sanskrit sarthavaha, meaning caravan leader) from Anxi (western Sogdiana or Parthia) who lived in Jiuquan during the Northern Wei (386 – 535 AD), was the ancestor of An Tugen, a man who rose from a common merchant to become a top ranking minister of state for the Northern Qi (550 – 577 AD). Valerie Hansen asserts that around this time and extending into the Tang Dynasty (618 – 907 AD), the Sogdians "became the most influential of the non-Chinese groups resident in China," settling throughout Chinese territory, marrying Chinese women, purchasing land, with newcomers living there permanently instead of returning to their homelands in Sogdiana. They were concentrated in large numbers around Luoyang and Chang'an, but also Xiangyang in Hubei, building Zoroastrian temples to service their communities once they reached the threshold of roughly 100 households. From the Northern Qi to Tang periods, the leaders of these communities, the sabao, were incorporated into the official hierarchy of state officials. Their burial practices blended both Chinese forms such as carved funerary beds with Zoroastrian sensibilities in mind, such as separating the body from both the earth and water. 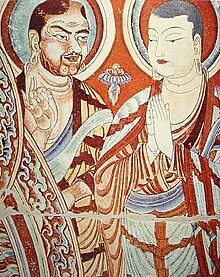 Two Buddhist monks on a mural of the Bezeklik Thousand Buddha Caves near Turpan, Xinjiang, China, 9th century AD. Albert von Le Coq (1913) assumed the blue-eyed, red-haired monk was a Tocharian, modern scholarship however identified similar Caucasian figures of the same cave temple (No. 9) as ethnic Sogdians, who were a minority in Turpan during the Tang Dynasty in 7th–8th century and Uyghur rule (9th–13th century). 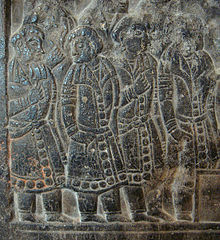 In addition to being merchants, monks, and government officials, Sogdians also served as soldiers in the Tang military. An Lushan, whose father was Sogdian and mother a Gokturk, rose to the position of a military governor (jiedushi) in the northeast before leading the An Lushan Rebellion (755 – 763 AD), which split the loyalties of the Sogdians in China. The An Lushan rebellion was supported by many Sogdians, and in its aftermath many of them were slain or changed their names to escape their Sogdian heritage, so that little is known about the Sogdian presence in North China since that time. Sogdians continued as active traders in China following the defeat of the rebellion, but many of them were compelled to hide their ethnic identity. A prominent case was An Chongzhang, Minister of War, and Duke of Liang who, in 756, asked Emperor Suzong of Tang to allow him to change his name to Li Baoyu because of his shame in sharing the same surname with the rebel leader. This change of surnames was enacted retroactively for all of his family members, so that his ancestors would also be bestowed the surname Li. From the Chinese surnames listed in the Tang-era Dunhuang manuscript Pelliot chinois 3319V (containing the following text: 石定信右全石丑子石定奴福延福全保昌張丑子李千子李定信), the names of the Nine Zhaowu Clans (or the "nine jeweled surnames" 昭武九姓), the prominent ethnic Sogdian families of China, have been deduced. Of these the most common Sogdian surname throughout China was Shi (石, generally given to those from Chach, modern Tashkent), whereas the surnames Shi (史, from Kesh, modern Shahrisabz), An (安, from Bukhara), Mi (米, from Panjakent), Kang (康, from Samarkand), Cao (曹, from Kabudhan, north of the Zeravshan River), and He (何, from Kushaniyah) appear frequently in Dunhuang manuscripts and registers. The influence of Sinicized and multilingual Sogdians during this Guiyijun (歸義軍) period (c. 850 – c. 1000 AD) of Dunhuang is evident in a large number of manuscripts written in Chinese characters from left to right instead of vertically, mirroring the direction of how the Sogdian alphabet is read. Sogdians of Dunhuang also commonly formed and joined lay associations among their local communities, convening at Sogdian-owned taverns in scheduled meetings mentioned in their epistolary letters. Sogdians living in Turfan under the Tang dynasty and Gaochang Kingdom engaged in a variety of occupations that included: farming, military service, painting, leather crafting and selling products such as iron goods. The Sogdians had been migrating to Turfan since the 4th century, yet the pace of migration began to climb steadily with the Muslim conquest of Persia and Fall of the Sasanian Empire in 651, followed by the Islamic conquest of Samarkand in 712. Qutayba ibn Muslim (669–716), Governor of Greater Khorasan under the Umayyad Caliphate (661–750), initiated the Muslim conquest of Sogdia during the early 8th century, with the local ruler of Balkh offering him aid as an Umayyad ally. However, when his successor Al-Jarrah ibn Abdallah governed Khorosan (717–719), many native Sogdians, who had converted to Islam, began to revolt when they were no longer exempt from paying the tax on non-Muslims, the jizya, because of a new law stating that proof of circumcision and literacy in the Quran was necessary for new converts. With the aid of Turkic peoples, the Sogdians were able to expel the Umayyad Arab garrison from Samarkand and Umayyad attempts to restore power there were rebuffed until the arrival of Sa'id ibn Amr al-Harashi (fl. 720–735). The Sogdian ruler (i.e. ikhshid) of Samarkand, Gurak, who had previously overthrown the pro-Umayyad Sogdian ruler Tarkhun in 710, decided that resistance against al-Harashi's large Arab force was pointless and thereafter persuaded his followers to declare allegiance to the Umayyad governor. Divashtich (r. 706–722), the Sogdian ruler of Panjakent, led his forces to the Zarafshan Range (near modern Zarafshan, Tajikistan), whereas the Sogdians following Karzanj, the ruler of Pai (modern Kattakurgan, Uzbekistan), fled to the Principality of Farghana, where their ruler at-Tar (or Alutar) promised them safety and refuge from the Umayyads. However, at-Tar secretly informed al-Harashi of the Sogdians hiding in Khujand, who were then slaughtered by al-Harashi's forces after their arrival. During the early 13th century Khwarezmia was invaded by the early Mongol Empire and its ruler Genghis Khan destroyed the once vibrant cities of Bukhara and Samarkand. However, in 1370 Samarkand saw a revival as the capital of the Timurid Empire. The Turko-Mongol ruler Timur forcefully brought artisans and intellectuals from across Asia to Samarkand, transforming it not only into a trade hub but also one of the most important cities of the Islamic world. Among the Sogdian Christians known in China from inscriptions and texts were An Yena, a Christian from An country (Bukhara). Mi Jifen a Christian from Mi country (Maymurgh), Kang Zhitong, a Sogdian Christian cleric from Kang country (Samarkand), Mi Xuanqing a Sogdian Christian cleric from Mi country (Maymurgh), Mi Xuanying, a Sogdian Christian cleric from Mi country (Maymurgh), An Qingsu, a Sogdian Christian monk from An country (Bukhara). When visiting Yuan-era Zhenjiang, Jiangsu, China during the late 13th century, the Venetian explorer and merchant Marco Polo noted that a large number of Christian churches had been built there. His claim is confirmed by a Chinese text of the 14th century explaining how a Sogdian named Mar-Sargis from Samarkand founded six Nestorian Christian churches there in addition to one in Hangzhou during the second half of the 13th century. Nestorian Christianity had existed in China earlier during the Tang Dynasty when a Persian monk named Alopen came to Chang'an in 653 to proselytize, as described in a dual Chinese and Syriac language inscription from Chang'an (modern Xi'an) dated to the year 781. Within the Syriac inscription is a list of priests and monks, one of whom is named Gabriel, the archdeacon of "Xumdan" and "Sarag", the Sogdian names for the Chinese capital cities Chang'an and Luoyang, respectively. In regards to textual material, the earliest Christian gospel texts translated into Sogdian coincide with the reign of the Sasanian Persian monarch Yazdegerd II (r. 438–457) and were translated from the Peshitta, the standard version of the Bible in Syriac Christianity. ^ Jacques Gernet (31 May 1996). A History of Chinese Civilization. Cambridge University Press. pp. 286–. ISBN 978-0-521-49781-7. ^ "Soghdian Kai Yuans (lectured at the Dutch 1994-ONS meeting)". T.D. Yih and J. de Kreek (hosted on the Chinese Coinage Website). 1994. Retrieved 8 June 2018. ^ "Samarqand's Cast Coinage of the Early 7th–Mid-8th Centuries AD: Assessment based on Chinese sources and numismatic evidence". Andrew Reinhard (Pocket Change – The blog of the American Numismatic Society). 12 August 2016. Retrieved 9 June 2018. ^ Mark J. Dresden (1981), "Introductory Note," in Guitty Azarpay, Sogdian Painting: the Pictorial Epic in Oriental Art, Berkeley, Los Angeles, London: University of California Press, pp 2–3, ISBN 0-520-03765-0. ^ "Avesta: Vendidad (English): Fargard 1". Avesta.org. Archived from the original on 4 October 2016. Retrieved 4 January 2016. ^ a b c d Mark J. Dresden (2003), "Sogdian Language and Literature", in Ehsan Yarshater, The Cambridge History of Iran, Vol III: The Seleucid, Parthian, and Sasanian Periods, Cambridge: Cambridge University Press, p. 1216, ISBN 0-521-24699-7. ^ a b c Chisholm, Hugh, ed. (1911). "Sogdiana" . Encyclopædia Britannica (11th ed.). Cambridge University Press. ^ Szemerényi 1980, pp. 45–46. ^ Szemerényi 1980, pp. 26–36. ^ Szemerényi 1980, p. 39. ^ a b c Antoine Simonin. (8 January 2012). "Sogdiana." Ancient History Encyclopedia. Retrieved 31 August 2016. ^ É. de La Vaissière (2011), "SOGDIANA iii. HISTORY AND ARCHEOLOGY," Encyclopædia Iranica, online edition (accessed on 31 August 2016). ^ a b Christoph Baumer (2012), The History of Central Asia: the Age of the Steppe Warriors, London, New York: I.B. Tauris, p. 202–203, ISBN 978-1-78076-060-5. ^ a b Mark J. Dresden (1981), "Introductory Note," in Guitty Azarpay, Sogdian Painting: the Pictorial Epic in Oriental Art, Berkeley, Los Angeles, London: University of California Press, p. 3, ISBN 0-520-03765-0. ^ Pierre Briant (2002), From Cyrus to Alexander: a History of the Persian Empire, trans. Peter T. Daniels, Winona Lake: Eisenbrauns, p. 746, ISBN 1-57506-120-1. ^ a b Christoph Baumer (2012), The History of Central Asia: the Age of the Steppe Warriors, London, New York: I.B. Tauris, p. 207, ISBN 978-1-78076-060-5. ^ Hansen, Valerie (2012), The Silk Road: A New History, Oxford University Press, p. 72, ISBN 978-0-19-993921-3. ^ a b c Liu, Xinru (2010), The Silk Road in World History, Oxford and New York: Oxford University Press, p 67. ^ Christopoulos, Lucas (August 2012), "Hellenes and Romans in Ancient China (240 BC – 1398 AD)," in Victor H. Mair (ed), Sino-Platonic Papers, No. 230, Chinese Academy of Social Sciences, University of Pennsylvania Department of East Asian Languages and Civilizations, pp 15–16, ISSN 2157-9687. ^ John Prevas (2004), Envy of the Gods: Alexander the Great's Ill-Fated Journey across Asia, Da Capo Press, pp 60–69. ^ Horn, LT Bernd; Spencer, Emily, eds. (2012), No Easy Task: Fighting in Afghanistan, Dundurn Press Ltd, p. 40, ISBN 978-1-4597-0164-9. ^ a b c d e Ahmed, S. Z. (2004), Chaghatai: the Fabulous Cities and People of the Silk Road, West Conshokoken: Infinity Publishing, p. 61. ^ a b c d Livius.org. "Roxane." Articles on Ancient History. Page last modified 17 August 2015. Retrieved on 29 August 2016. ^ a b c d Strachan, Edward and Roy Bolton (2008), Russia and Europe in the Nineteenth Century, London: Sphinx Fine Art, p. 87, ISBN 978-1-907200-02-1. ^ William Smith, eds et al. (1873), A Dictionary of Greek and Roman Biography and Mythology, Volume 1, London: John Murray, p. 122. ^ a b Holt, Frank L. (1989), Alexander the Great and Bactria: the Formation of a Greek Frontier in Central Asia, Leiden, New York, Copenhagen, Cologne: E. J. Brill, pp 64–65 (see also footnote #62 for mention of Sogdian troops), ISBN 90-04-08612-9. ^ Holt, Frank L. (1989), Alexander the Great and Bactria: the Formation of a Greek Frontier in Central Asia, Leiden, New York, Copenhagen, Cologne: E. J. Brill, p. 65 (see footnote #63), ISBN 90-04-08612-9. ^ a b c d Magill, Frank N. et al. (1998), The Ancient World: Dictionary of World Biography, Volume 1, Pasadena, Chicago, London,: Fitzroy Dearborn Publishers, Salem Press, p. 1010, ISBN 0-89356-313-7. ^ Chisholm, Hugh, ed. (1911). "Apamea" . Encyclopædia Britannica (11th ed.). Cambridge University Press. ^ Christopoulos, Lucas (August 2012), "Hellenes and Romans in Ancient China (240 BC – 1398 AD)," in Victor H. Mair (ed), Sino-Platonic Papers, No. 230, Chinese Academy of Social Sciences, University of Pennsylvania Department of East Asian Languages and Civilizations, pp 8–9, ISSN 2157-9687. ^ Mark J. Dresden (1981), "Introductory Note," in Guitty Azarpay, Sogdian Painting: the Pictorial Epic in Oriental Art, Berkeley, Los Angeles, London: University of California Press, pp 3–5, ISBN 0-520-03765-0. ^ Jeffrey D. Lerner (1999), The Impact of Seleucid Decline on the Eastern Iranian Plateau: the Foundations of Arsacid Parthia and Graeco-Bactria, Stuttgart: Steiner, pp 82–84, ISBN 3-515-07417-1. ^ Michon, Daniel (2015), Archaeology and Religion in Early Northwest India: History, Theory, Practice, London, New York, New Delhi: Routledge, pp 112–123, ISBN 978-1-138-82249-8. ^ Schuyler V. Cammann, review of Homer H. Dubs, A Roman City in Ancient China in The Journal of Asian Studies, Vol. 21, No. 3 (May 1962), pp. 380–382. See also reply by Dubs in The Journal of Asian Studies, Vol. 22, No. 1 (November 1962), pp. 135–136. ^ a b c Wood, Francis (2002). 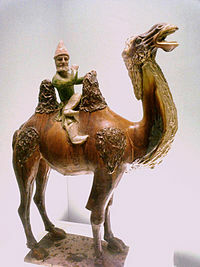 The Silk Road: Two Thousand Years in the Heart of Asia. Berkeley, CA: University of California Press. pp. 65–68. ISBN 978-0-520-24340-8. ^ Gorshenina, Svetlana; Rapin, Claude (2001). "Chapitre 5 : Des Kouchans à l'Islam – Les Sogdiens sur la route de la soie". De Kaboul à Samarcande : Les archéologues en Asie centrale. Collection "Découvertes Gallimard" (in French). 411. Paris: Éditions Gallimard. p. 104. ISBN 978-2-070-76166-1. ^ Watson, Burton (1993), Records of the Great Historian, Han Dynasty II, Columbia University Press, p. 234, ISBN 0-231-08167-7; see also: Loewe, Michael, (2000), A Biographical Dictionary of the Qin, Former Han, and Xin Periods (221 BC – AD 24), Leiden, Boston, Koln: Koninklijke Brill NV, p 278, ISBN 90-04-10364-3. ^ "Silk Road, North China [Northern Silk Road, North Silk Road] Ancient Trackway : The Megalithic Portal and Megalith Map:". Megalithic.co.uk. Retrieved 25 July 2017. ^ Hanks, Reuel R. (2010), Global Security Watch: Central Asia, Santa Barbara, Denver, Oxford: Praeger, p. 3. ^ Mark J. Dresden (2003), "Sogdian Language and Literature", in Ehsan Yarshater, The Cambridge History of Iran, Vol III: The Seleucid, Parthian, and Sasanian Periods, Cambridge: Cambridge University Press, p. 1219, ISBN 0-521-24699-7. ^ Ahmed, S. Z. (2004), Chaghatai: the Fabulous Cities and People of the Silk Road, West Conshohocken: Infinity Publishing, pp 61–65. ^ a b c d e Howard, Michael C., Transnationalism in Ancient and Medieval Societies, the Role of Cross Border Trade and Travel, McFarland & Company, 2012, p. 134. ^ a b Howard, Michael C., Transnationalism in Ancient and Medieval Societies, the Role of Cross Border Trade and Travel, McFarland & Company, 2012, pp 133–34. ^ Grégoire Frumkin (1970), Archaeology in Soviet Central Asia, Leiden, Koln: E. J. Brill, pp 35–37. ^ a b de la Vaissiere, Etienne (20 July 2004). "Sogdian Trade". Encyclopedia Iranica. Retrieved 4 November 2011. ^ Stark, Sören. Die Alttürkenzeit in Mittel- und Zentralasien. Archäologische und historische Studien (Nomaden und Sesshafte, vol. 6). Reichert, 2008 ISBN 3-89500-532-0. ^ Skaff, Jonathan Karam (2012). Sui-Tang China and Its Turko-Mongol Neighbors: Culture, Power, and Connections, 580-800. Oxford Studies in Early Empires. Oxford University Press. p. 245. ISBN 0199875901. ^ a b c Liu, Xinru, "The Silk Road: Overland Trade and Cultural Interactions in Eurasia", in Agricultural and Pastoral Societies in Ancient and Classical History, ed. Michael Adas, American Historical Association, Philadelphia: Temple University Press, 2001, p. 169. ^ Peter B. Golden (2011), Central Asia in World History, Oxford, New York: Oxford University Press, p. 47, ISBN 978-0-19-515947-9. ^ a b c d Mark J. Dresden (1981), "Introductory Note," in Guitty Azarpay, Sogdian Painting: the Pictorial Epic in Oriental Art, Berkeley, Los Angeles, London: University of California Press, p. 5, ISBN 0-520-03765-0. ^ a b c d e f Mark J. Dresden (2003), "Sogdian Language and Literature", in Ehsan Yarshater, The Cambridge History of Iran, Vol III: The Seleucid, Parthian, and Sasanian Periods, Cambridge: Cambridge University Press, p. 1217, ISBN 0-521-24699-7. ^ a b c Liu, Xinru, "The Silk Road: Overland Trade and Cultural Interactions in Eurasia", in Agricultural and Pastoral Societies in Ancient and Classical History, ed. Michael Adas, American Historical Association, Philadelphia: Temple University Press, 2001, p. 168. ^ a b Mark J. Dresden (1981), "Introductory Note," in Guitty Azarpay, Sogdian Painting: the Pictorial Epic in Oriental Art, Berkeley, Los Angeles, London: University of California Press, p. 9, ISBN 0-520-03765-0. ^ de Crespigny, Rafe (2007), A Biographical Dictionary of Later Han to the Three Kingdoms (23–220 AD), Leiden: Koninklijke Brill, p. 600, ISBN 978-90-04-15605-0. ^ Brosius, Maria (2006), The Persians: An Introduction, London & New York: Routledge, pp 122–123, ISBN 0-415-32089-5. ^ An, Jiayao (2002), "When Glass Was Treasured in China", in Juliano, Annette L. and Judith A. Lerner, Silk Road Studies: Nomads, Traders, and Holy Men Along China's Silk Road, 7, Turnhout: Brepols Publishers, pp. 79–94, ISBN 2-503-52178-9. ^ a b c Hansen, Valerie (2012), The Silk Road: A New History, Oxford: Oxford University Press, p. 97, ISBN 978-0-19-993921-3. ^ Hansen, Valerie (2012), The Silk Road: A New History, Oxford: Oxford University Press, pp 97–98, ISBN 978-0-19-993921-3. ^ Rong Xinjiang, "The Sogdian Caravan as Depicted in the Relieves of the Stone Sarcophagus from Shi's Tomb of the Northern Zhou" in Chinese Archaeology. Volume 6, Issue 1, pp 181–185, ISSN (Online) 2160–5068, ISSN (Print) 5004-4295, DOI: 10.1515/CHAR.2006.6.1.181, January 2006. ^ Howard, Michael C., Transnationalism in Ancient and Medieval Societies, the Role of Cross Border Trade and Travel, McFarland & Company, 2012, pp 134–35. ^ a b c d e f g h i Hansen, Valerie (2012), The Silk Road: A New History, Oxford University Press, p. 98, ISBN 978-0-19-993921-3. ^ a b c d e f Howard, Michael C., Transnationalism in Ancient and Medieval Societies, the Role of Cross Border Trade and Travel, McFarland & Company, 2012, p. 135. ^ The Goguryeo general Gao Juren ordered a mass slaughter of West Asians (Hu) identifying them through their big noses and lances were used to impale tossed children when he stormed Beijing from An Lushan's rebels. For further information on that, see Hansen, Valerie (2003). "New Work on the Sogdians, the Most Important Traders on the Silk Road, A.D. 500-1000". T'oung Pao. Brill. 89 (1/3): 158. JSTOR 4528925. ^ Galambos, Imre (2015), "She Association Circulars from Dunhuang", in Antje Richter, A History of Chinese Letters and Epistolary Culture, Brill: Leiden, Boston, pp 870–71. ^ Taenzer, Gertraud (2016), "Changing Relations between Administration, Clergy and Lay People in Eastern Central Asia: a Case Study According to the Dunhuang Manuscripts Referring to the Transition from Tibetan to Local Rule in Dunhuang, 8th–11th Centuries", in Carmen Meinert, Transfer of Buddhism Across Central Asian Networks (7th to 13th Centuries), Leiden, Boston: Brill, pp 35–37. ^ Galambos, Imre (2015), "She Association Circulars from Dunhuang", in Antje Richter, A History of Chinese Letters and Epistolary Culture, Brill: Leiden, Boston, p 871. ^ Galambos, Imre (2015), "She Association Circulars from Dunhuang", in Antje Richter, A History of Chinese Letters and Epistolary Culture, Brill: Leiden, Boston, pp 871–72. ^ Galambos, Imre (2015), "She Association Circulars from Dunhuang", in Antje Richter, A History of Chinese Letters and Epistolary Culture, Brill: Leiden, Boston, p. 872. ^ Galambos, Imre (2015), "She Association Circulars from Dunhuang", in Antje Richter, A History of Chinese Letters and Epistolary Culture, Brill: Leiden, Boston, pp 870, 873. ^ Galambos, Imre (2015), "She Association Circulars from Dunhuang", in Antje Richter, A History of Chinese Letters and Epistolary Culture, Brill: Leiden, Boston, pp 872–73. ^ Litvinski, B. A., A. H. Jalilov, A. I. Kolesnikov (1999), "The Arab Conquest", in History of Civilizations of Central Asia: Volume III, the Crossroads of Civilizations: A.D. 250–750, eds B. A. Litvinski, Zhang Guangda, and R. Shabani Samghabadi, Delhi: Motilal Banarsidass Publishers Private Limited, pp 457–58. ^ a b c d Litvinski, B. A., A. H. Jalilov, A. I. Kolesnikov (1999), "The Arab Conquest", in History of Civilizations of Central Asia: Volume III, the Crossroads of Civilizations: A.D. 250–750, eds B. A. Litvinski, Zhang Guangda, and R. Shabani Samghabadi, Delhi: Motilal Banarsidass Publishers Private Limited, p. 459. ^ Litvinski, B. A., A. H. Jalilov, A. I. Kolesnikov (1999), "The Arab Conquest", in History of Civilizations of Central Asia: Volume III, the Crossroads of Civilizations: A.D. 250–750, eds B. A. Litvinski, Zhang Guangda, and R. Shabani Samghabadi, Delhi: Motilal Banarsidass Publishers Private Limited, pp 459–60. ^ a b c d Hanks, Reuel R. (2010), Global Security Watch: Central Asia, Santa Barbara, Denver, Oxford: Praeger, p. 4. ^ Hanks, Reuel R. (2010), Global Security Watch: Central Asia, Santa Barbara, Denver, Oxford: Praeger, pp 4–5. ^ Sophie Ibbotson and Max Lovell-Hoare (2016), Uzbekistan, 2nd edition, Bradt Travel Guides Ltd, pp 12–13, ISBN 978-1-78477-017-4. ^ Sophie Ibbotson and Max Lovell-Hoare (2016), Uzbekistan, 2nd edition, Bradt Travel Guides Ltd, pp 14–15, ISBN 978-1-78477-017-4. ^ Luce Boulnois (2005), Silk Road: Monks, Warriors & Merchants, Odyssey Books, pp 239–241, ISBN 962-217-721-2. ^ Kazuo Enoki (1998), "Yü-ni-ch'êng and the Site of Lou-Lan," and "The Location of the Capital of Lou-Lan and the Date of the Kharoshthi Inscriptions," in Rokuro Kono (ed. ), Studia Asiatica: The Collected Papers in Western Languages of the Late Dr. Kazuo Enoki, Tokyo: Kyu-Shoin, pp 200, 211–57. ^ Christopoulos, Lucas (August 2012), "Hellenes and Romans in Ancient China (240 BC – 1398 AD)," in Victor H. Mair (ed), Sino-Platonic Papers, No. 230, Chinese Academy of Social Sciences, University of Pennsylvania Department of East Asian Languages and Civilizations, pp 20–21 footnote #38, ISSN 2157-9687. ^ A. M. Belenitskii and B. I. Marshak (1981), "Part One: the Paintings of Sogdiana" in Guitty Azarpay, Sogdian Painting: the Pictorial Epic in Oriental Art, Berkeley, Los Angeles, London: University of California Press, p. 47, ISBN 0-520-03765-0. ^ A. M. Belenitskii and B. I. Marshak (1981), "Part One: the Paintings of Sogdiana" in Guitty Azarpay, Sogdian Painting: the Pictorial Epic in Oriental Art, Berkeley, Los Angeles, London: University of California Press, p. 13, ISBN 0-520-03765-0. ^ A. M. Belenitskii and B. I. Marshak (1981), "Part One: the Paintings of Sogdiana" in Guitty Azarpay, Sogdian Painting: the Pictorial Epic in Oriental Art, Berkeley, Los Angeles, London: University of California Press, pp 34–35, ISBN 0-520-03765-0. ^ a b c d Tafazzoli, A. (2003), "Iranian Languages," in C. E. Bosworth and M. S. Asimov, History of Civilizations of Central Asia, Volume IV: The Age of Achievement, A.D. 750 to the End of the Fifteenth Century, Delhi: Motilal Banarsidass Publishers Private Limited, p 323. ^ Tafazzoli, A. (2003), "Iranian Languages," in C. E. Bosworth and M. S. Asimov, History of Civilizations of Central Asia, Volume IV: The Age of Achievement, A.D. 750 to the End of the Fifteenth Century, Delhi: Motilal Banarsidass Publishers Private Limited, pp 325–26. ^ Mark J. Dresden (1981), "Introductory Note," in Guitty Azarpay, Sogdian Painting: the Pictorial Epic in Oriental Art, Berkeley, Los Angeles, London: University of California Press, pp 5–6, ISBN 0-520-03765-0. ^ Boyce, Mary (1983), "Parthian Writings and Literature", in Ehsan Yarshater, Cambridge History of Iran, 3.2, London & New York: Cambridge University Press, pp. 1151–1152. ISBN 0-521-20092-X. ^ Tafazzoli, A. (2003), "Iranian Languages," in C. E. Bosworth and M. S. Asimov, History of Civilizations of Central Asia, Volume IV: The Age of Achievement, A.D. 750 to the End of the Fifteenth Century, Delhi: Motilal Banarsidass Publishers Private Limited, p 325. ^ Paul Bergne (15 June 2007). The Birth of Tajikistan: National Identity and the Origins of the Republic. I.B.Tauris. pp.��6–. ISBN 978-1-84511-283-7. ^ Mark J. Dresden (1981), "Introductory Note," in Guitty Azarpay, Sogdian Painting: the Pictorial Epic in Oriental Art, Berkeley, Los Angeles, London: University of California Press, pp 2 & 5, ISBN 0-520-03765-0. ^ a b Yatsenko, Sergey A. (2003). "The Late Sogdian Costume (the 5th – 8th centuries)". Transoxiana (Webfestschrift Marshak). ^ a b Grenet, Frantz (2007). "Religious Diversity among Sogdian Merchants in Sixth-Century China: Zoroastrianism, Buddhism, Manichaeism, and Hinduism". Comparative Studies of South Asia, Africa and the Middle East. Duke University Press. 27 (2): 463–478. doi:10.1215/1089201x-2007-017. ^ A. M. Belenitskii and B. I. Marshak (1981), "Part One: the Paintings of Sogdiana" in Guitty Azarpay, Sogdian Painting: the Pictorial Epic in Oriental Art, Berkeley, Los Angeles, London: University of California Press, p. 35, ISBN 0-520-03765-0. ^ Liu, Xinru (2010), The Silk Road in World History, Oxford and New York: Oxford University Press, p 67–8. ^ Dresden, Mark J. (2003), "Sogdian Language and Literature", in Ehsan Yarshater, The Cambridge History of Iran, Vol III: The Seleucid, Parthian, and Sasanian Periods, Cambridge: Cambridge University Press, p. 1224, ISBN 0-521-24699-7. ^ "A Mathematic Expression of Art: Sino-Iranian and Uighur Textile Interaction and the Turfan Textile Collection in Berlin | Gasparini | Transcultural Studies". Heiup.uni-heidelberg.de. 3 January 2014. Retrieved 25 July 2017. ^ a b c d Braja Bihārī Kumar (2007). "India and Central Asia: Links and Interactions," in J.N. Roy and B.B. Kumar (eds), India and Central Asia: Classical to Contemporary Periods, 3–33. New Delhi: Published for Astha Bharati Concept Publishing Company. ISBN 81-8069-457-7, p. 8. ^ Nicolini-Zani, Mattco (2013). Tang, Li; Winkler, Dietmar W. (eds.). From the Oxus River to the Chinese Shores: Studies on East Syriac Christianity in China and Central Asia (illustrated ed.). LIT Verlag Münster. ISBN 3643903294. ^ Nicolini-Zani, Matteo (2006). La via radiosa per l'Oriente: i testi e la storia del primo incontro del cristianesimo con il mondo culturale e religioso cinese (secoli VII-IX). Spiritualità orientale. Edizioni Qiqajon, Comunità di Bose. p. 121. ISBN 8882272125. ... di almeno un testo cristiano in cinese, il rotolo P. 3847, contenente la traduzione cinese dell'inno siriaco Gloria in excelsis Deo, di cui fu redatta anche una traduzione sogdiana(giunta a noi in frammenti) a Bulayìq (Turfan). L'unico elemento che ci conferma, infine, una assai probabile presenza cristiana in quest'epoca nel sud della Cina, legata ai commerci marittimi, è il ritrovamento presso Guilin (odierno Guangxi) dell'epitaffio funebre del cristiano An Yena, morto tra il 707 e il 709. ^ Emmerick, R. E. (2003) "Iranian Settlement East of the Pamirs", in Ehsan Yarshater, The Cambridge History of Iran, Vol III: The Seleucid, Parthian, and Sasanian Periods, Cambridge: Cambridge University Press, pp 275. ^ Emmerick, R. E. (2003) "Iranian Settlement East of the Pamirs", in Ehsan Yarshater, The Cambridge History of Iran, Vol III: The Seleucid, Parthian, and Sasanian Periods, Cambridge: Cambridge University Press, pp 274. ^ Dresden, Mark J. (2003), "Sogdian Language and Literature", in Ehsan Yarshater, The Cambridge History of Iran, Vol III: The Seleucid, Parthian, and Sasanian Periods, Cambridge: Cambridge University Press, pp 1225–1226, ISBN 0-521-24699-7. ^ Hulsewé, A.F.P. (1986). "Ch'in and Han law," in The Cambridge History of China: Volume I: the Ch'in and Han Empires, 221 B.C. – A.D. 220, 520–544. Edited by Denis Twitchett and Michael Loewe. Cambridge: Cambridge University Press, pp 524–525, ISBN 0-521-24327-0. ^ Hucker, Charles O. (1975). China's Imperial Past: An Introduction to Chinese History and Culture. Stanford: Stanford University Press, p. 177, ISBN 0-8047-0887-8. ^ For specific figures in regards to perentage of the population being enslaved, see Frier, Bruce W. (2000). "Demography", in Alan K. Bowman, Peter Garnsey, and Dominic Rathbone (eds), The Cambridge Ancient History XI: The High Empire, A.D. 70–192. Cambridge: Cambridge University Press, pp 827–54. ^ Anders Hansson (1996), Chinese Outcasts: Discrimination and Emancipation in Late Imperial China, Leiden, New York, Koln: E.J. Brill, pp 38–39, ISBN 90-04-10596-4. ^ Anders Hansson (1996), Chinese Outcasts: Discrimination and Emancipation in Late Imperial China, Leiden, New York, Koln: E.J. Brill, p. 39, ISBN 90-04-10596-4. ^ Jonathan Karam Skaff (23 August 2012). Sui-Tang China and Its Turko-Mongol Neighbors: Culture, Power, and Connections, 580–800. OUP USA. pp. 70–. ISBN 978-0-19-973413-9. ^ a b c Hansen, Valerie. "Les Sogdiens en Chine : The Impact of the Silk Road Trade on a Local Community: The Turfan Oasis, 500–800" (PDF). History.yale.edu. Retrieved 25 July 2017. ^ Rong, Xinjiang, "New light on Sogdian Colonies along the Silk Road : Recent Archaeological Finds in Northern China (Lecture at the BBAW on 20th September 2001)", in Berichte und Abhandlungen (17 December 2009); 10, S., p. 150. ^ Éric Trombert; Étienne de La Vaissière (2005). Les sogdiens en Chine. École française d'Extrême-Orient. pp. 300–301. ISBN 978-2-85539-653-8. ^ Éric Trombert; Étienne de La Vaissière (2005). Les sogdiens en Chine. École française d'Extrême-Orient. p. 300. ISBN 978-2-85539-653-8. ^ a b c Rong, Xinjiang, "New light on Sogdian Colonies along the Silk Road : Recent Archaeological Finds in Northern China (Lecture at the BBAW on 20th September 2001)", in Berichte und Abhandlungen (17 December 2009); 10, S., p. 148. ^ Rong, Xinjiang, "New light on Sogdian Colonies along the Silk Road : Recent Archaeological Finds in Northern China (Lecture at the BBAW on 20th September 2001)", in Berichte und Abhandlungen (17 December 2009); 10, S., pp 148–9. ^ von Le Coq, Albert. (1913). Chotscho: Facsimile-Wiedergaben der Wichtigeren Funde der Ersten Königlich Preussischen Expedition nach Turfan in Ost-Turkistan. Berlin: Dietrich Reimer (Ernst Vohsen), im Auftrage der Gernalverwaltung der Königlichen Museen aus Mitteln des Baessler-Institutes, p. 28, Tafel 20. (Accessed 3 September 2016). ^ VOHIDOV, RAHIM; ESHONQULOV, HUSNIDDIN (2006). "III-BOB X X II ASRLAR O'ZBEK ADABIYOTI 3 .1 . X -X II asrlardagi madaniy hayot". O'ZBEK MUMTOZ ADABIYOTI TARIXI (Eng qadimgi davrlardan XVI asr oxirigacha) (PDF). O'ZBEKISTON RESPUBLIKASI OLIY VA O'RTA MAXSUS TA'LIM VAZIRLIGI. p. 52. ^ Chen (陈), Boyi (博翼) (2011). "10 跋《明秦府承奉正康公墓志铭》"A Sogdian Descendant?—Study of the Epitaph of Kang Jing: The Man Who Served at Ming Prince Qin's Mansion,"". Collected Studies on Ming History 明史研究论丛. 9. China Academic Journal Electronic Publishing House. pp. 283–297. ^ 中國文物硏究所. 新中國出土墓誌: 陜西 (no.1-2). 文物出版社. ^ Donné Raffat; Buzurg ʻAlavī (1985). The Prison Papers of Bozorg Alavi: A Literary Odyssey. Syracuse University Press. pp. 85–. ISBN 978-0-8156-0195-1. ^ Ibn Taghribirdi, Jamal al-Din Abu al-Mahasin Yusuf (1930), Nujum al-zahira fi muluk Misr wa'l-Qahira, Volume II, Cairo: Dar al-Kutub al-Misriyya, p. 218. ^ Gordon, Matthew S. (2001), The Breaking of a Thousand Swords: A History of the Turkish Military of Samarra (A.H. 200-275/815-889 C.E. ), Albany, NY: State University of New York Press, p. 77, ISBN 0-7914-4795-2. ^ Carlos Ramirez-Faria (2007), Concise Encyclopedia of World History, New Delhi: Atlantic Publishers & Distributors, p. 450, ISBN 81-269-0775-4. ^ Pulleyblank, Edwin G. (1952). ""A Sogdian Colony in Inner Mongolia."". T'oung Pao, Second Series. 41: 317–56. JSTOR 4527336. This article incorporates text from a publication now in the public domain: Chisholm, Hugh, ed. (1911). "Sogdiana" . Encyclopædia Britannica (11th ed.). Cambridge University Press. Braja Bihārī Kumar (2007). "India and Central Asia: Links and Interactions," in J.N. Roy and B.B. Kumar (eds), India and Central Asia: Classical to Contemporary Periods, 3–33. New Delhi: Published for Astha Bharati Concept Publishing Company. ISBN 81-8069-457-7. Michon, Daniel (2015), Archaeology and Religion in Early Northwest India: History, Theory, Practice, London, New York, New Delhi: Routledge, ISBN 978-1-138-82249-8. Nguyen, Tai Thu (2008). The History of Buddhism in Vietnam. CRVP. pp. 36–. ISBN 978-1-56518-098-7. Archived from the original on 31 January 2015. Rong, Xinjiang, "The Sogdian Caravan as Depicted in the Relieves of the Stone Sarcophagus from Shi's Tomb of the Northern Zhou" in Chinese Archaeology. Volume 6, Issue 1, pp 181–185, ISSN (Online) 2160–5068, ISSN (Print) 5004-4295, DOI: 10.1515/CHAR.2006.6.1.181, January 2006. Tafazzoli, A. (2003), "Iranian Languages," in C. E. Bosworth and M. S. Asimov, History of Civilizations of Central Asia, Volume IV: The Age of Achievement, A.D. 750 to the End of the Fifteenth Century, Delhi: Motilal Banarsidass Publishers Private Limited, pp 323–30.